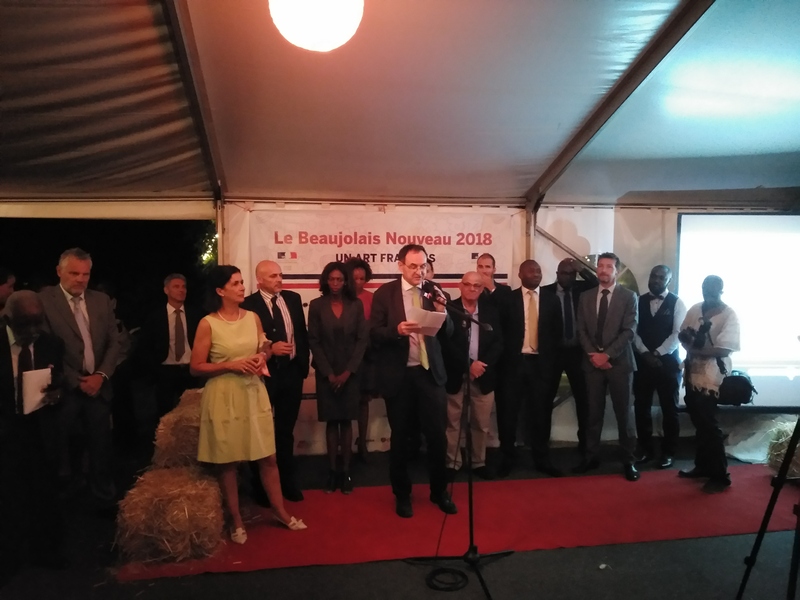 Pendant que la société française se pressait pour goûter ce vin nouveau, l’arrivée du Beaujolais Nouveau a été également joyeuse à Lusaka. Depuis le XXème siècle, il est devenu une tradition française de fêter le Beaujolais Nouveau. C’est un évènement toujours attendu et apprécié. C’est un vin de primeur, ou vin jeune, dont la vinification est suivie par une commercialisation quasiment immédiate. Il est produit dans les départements du Rhône, de la Loire et de la Saône-et-Loire, autour de la rivière Nizerand. Ce vin bénéficie également d’une Appellation d’Origine Contrôlée (AOC), qui certifie sa production. La commercialisation du Beaujolais intervient chaque année le troisième jeudi du mois de novembre. Ainsi, ce jeudi 15 novembre, l’Ambassade de France en Zambie a célébré l’arrivée du Beaujolais Nouveau. Cette soirée devenue traditionnelle, à la Résidence de France, s’est rapidement fait un nom à Lusaka, dans la sphère diplomatique, mais bien au-delà également. 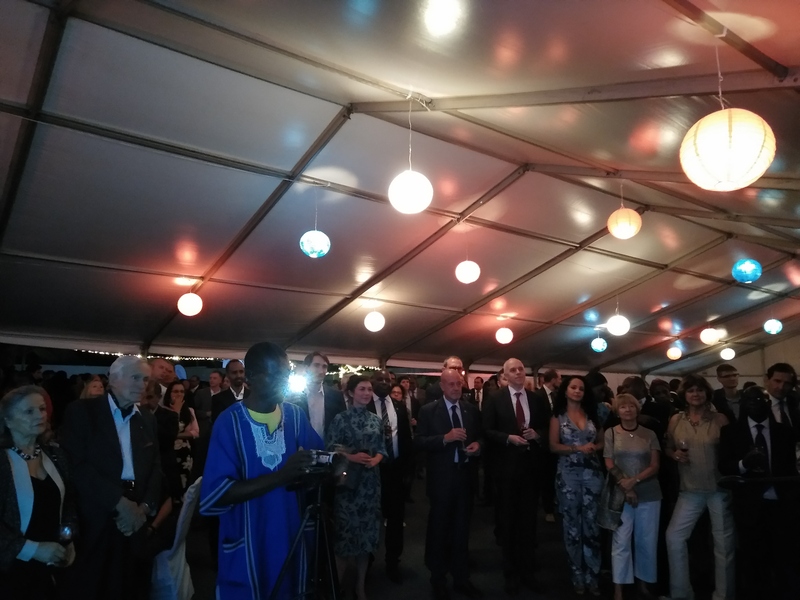 Cette année, la fête a été organisée par la toute nouvelle Chambre de Commerce Franco-Zambienne. Sur fond champêtre (bottes de foin, tonneaux de vin et nappes vichy à l’appui), dans une ambiance informelle et bon enfant, elle a rassemblé environ 750 invités, qui ont pu apprécier le choix de fromages et de charcuterie française, et bien évidemment, le Beaujolais. Tous ces produits étaient arrivés juste à temps de France, par avion. Les invités ont apprécié cette French Touch en discutant autour de verres de vin. Certains ont également pu danser sur les rythmes des Cool Daddies, un groupe de musique zambien doucement entrainant. Good evening ! Mulibwanji ! On my wife’s behalf, and on my own behalf, I extend a heartfelt and warm welcome to all of you. Mwaiseni ! I welcome you also on behalf of our sponsors, 18 french companies, even more than last year. I have to repeat a bit, for those who were not there, what I said last year. Sorry for the others, who are used to come to this traditional party. 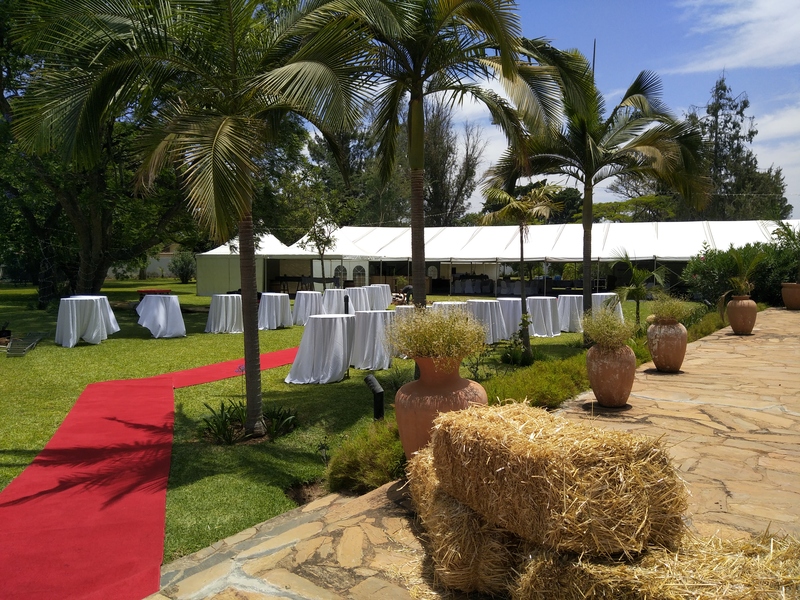 But there are a few changes : The first change stems from the fact that before, this party was organized by the embassy, supported by a group of sponsors ; now the recently created French-Zambian Chamber of commerce (FZCC) is organizing everything, with already a strong leadership ; of course always with the support of the Embassy and of those sponsoring companies. 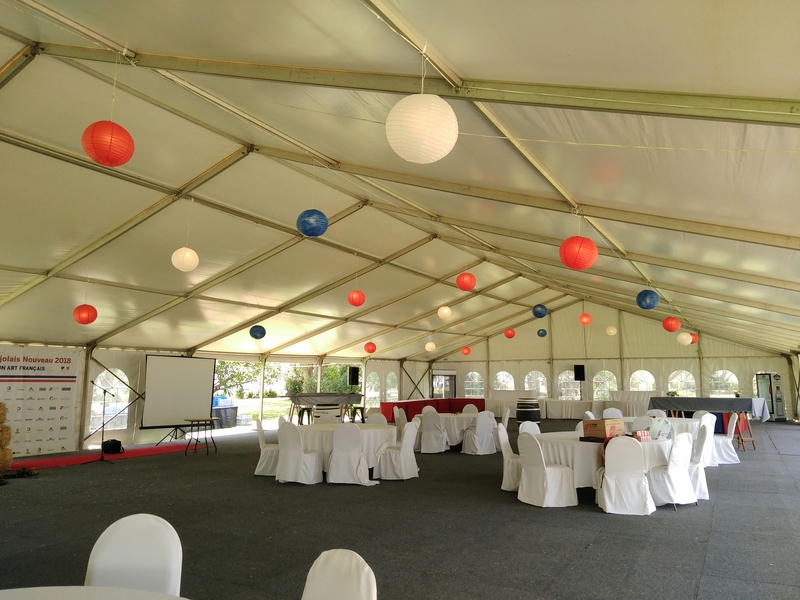 All were as helpful and successful in this preparation, as they are in their professional business and work in Zambia. I wished to entrust the FZCC with this new responsibility, I think my choice was right, I hope you will feel the same. In many other countries, it is the Chamber of Commerce who are already organizing this event ; in other countries, it is organized by a French community association, or by individuals, on a fully private or paying basis. 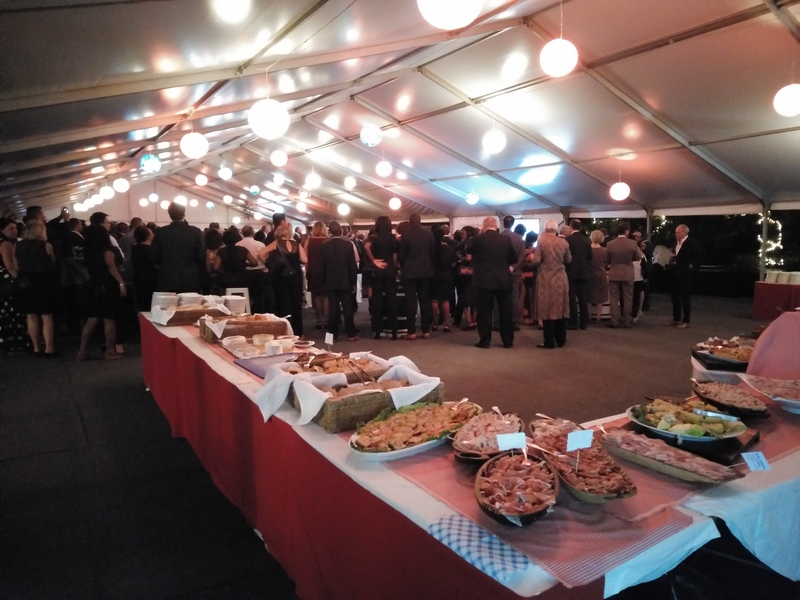 We organize this reception to celebrate together this annual event, but also to thank most of all the Zambians we have the honour and pleasure to work with, all year long, in a country we all like and love. Here you are in France. Especially this evening, because you take part to a very French tradition. This is not an official function, but a friendly private reception ; also because of the very nature of this event, which started in the restaurants and cafés in France, before becoming a kind of world event, celebrated at the same time, in many places around the world ; like on the night of the 31st of December. My speech won’t be political (this is not a national day cocktail) ; it should be just wine oriented ! The only serious political remark I would like to say, is the following : I’m pleased, that after the commemorations of centenary of the end of WW1, which was rightly done, on the 11th of November, in a sober manner, not as a celebration of victory, given the millions of victims of the war (and, thanks to the creation and development of the European Union, the complete change of relations between European countries since 1918), we can celebrate and share tonight a joyful moment. Without our glorious predecessors, we probably wouldn’t be there, drinking wine together. I could add, after the commemoration on the 13th of November of terrorist attacks in Paris of the 2015, when 130 French citizens were killed the same evening by a few fanatics, condemning our way of life, I’m glad that we can still enjoy good glasses of wine, in music (today we will hear, for the first time, the “Cool daddies”). In 1919, its box celebrated the victory of allies, with the drawing of a female allegory of France, holding a torch with the flame of progress, tricolor flags, the Globe, and the slogan : “la France, Reine du monde ! (France, Queen of the world)”. “Beaujolais nouveau” is a French wine, produced in the Beaujolais region of France, in Burgondy, a red wine with the particularity of being sold the same year it is harvested. Its release, always occurring the third week of November, has become internationally honored. Half of the whole Beaujolais year wine production is drunk in this period. Those producers were clever ! The release of Beaujolais nouveau is now very much expected, by a large public, amateur of wine or not -some are just there for the fun and the friendly atmosphere of this very moment. The wine is released just weeks after the wine’s grapes harvest. Parties are held throughout the country and further away to celebrate the first wine of the season. “Beaujolais Nouveau” doesn’t mean “New Beaujolais”, like google translation would propose ; because every wine, year after year, is new and could be then called “nouveau” ; “Beaujolais nouveau” means “primeur”, wine meant to be drunk young. It is the most popular “vin de primeur”, fermented for just a few weeks before being released for sale, on this third Thursday of November. By sharing this event with us, you share an event celebrated across the world, and you also travel in time. Because the Beaujolais nouveau is an old story. Already in the XIXth century, some wine companies used to buy this Beaujolais « sous le pressoir » (under the grapes press), and distributed it in the following weeks to the restaurants and cafés, of the cities of Lyon, then Paris. This "Beaujolais Nouveau Day" started with races to get the first bottles to different markets around the globe. The idea of a race from Beaujolais region to Paris, carrying the first bottles of the new vintage attracted progressively media attention. By the 1970s, the race became a national event. Then the races spread to neighboring countries in Europe in the 1980s, followed by other continents in the 1990s. As the release practice is to ship the wine ahead of that date, and deliver it to the local markets at 12:01 a.m. local time. No race here ; it was maybe a bit too far ; the bottles arrived from Paris by plane, in time, thanks to Bolloré ! The same for cheese and sausages. Because the taste is better when you mix this wine with these French culinarian specialties. This is a second change this year : usually, we complemented here French food by an international dinner, with beers, and so on ; this year, the organizers decided to get back to basics, respecting the real tradition : only cheese, charcuterie and Beaujolais (only water and a few soft drinks are accepted, by exception !) ; the decoration chosen also insists on this farm dimension, with those bales of straw. A third change is the weather : last year, rainy ; fortunately, wine, warm friendship, music and songs, helped us to forget this uninvited rain. This year, it is warm. I even hope the wine can be served chilled enough, as it should ! (thanks to Intercontinental hotel team). Beaujolais is not a wine for wine snobs. This fresh and fruity red is the result of a quick fermentation process that ends up with a tasty, clean wine that enjoyed by palates the world over. Beaujolais has become the symbol of festive wine, simple, easy to drink. The traditional slogan used in advertisement campaigns is “Le Beaujolais nouveau est arrivé”, which translates to “The Beaujolais primeur has arrived”. Created in 1948, The Ordre des Compagnons (chapter of friends) du Beaujolais is an esteemed French organization dedicated to promote the wines of the Beaujolais region. It has now Chapters in many countries around the world, united by their love of Beaujolais wines, the most lively and unpretentious French libation. Not yet here. Why not ? I’m sure we could find here spontaneously dedicated Beaujolais drinkers ! Incredibly enough, the wines from Beaujolais are affordable. I hope Zambian wine importers will realize the benefit for them to organize also parties, in the future, to promote Beaujolais. By the way, I visited Chablis region, last august, with a group of French ambassadors. Chablis, also in Burgondy, is an excellent French wine, more expensive than Beaujolais ; but maybe someday, we will be able to organize a Chablis party here ! One philosophical : "The only weapon I tolerate is the corkscrew" ; a french movie actor used to say that ; he is now dead, which is another lesson to learn from him, let’s enjoy the good times of life. One more practical : abuse of alcool is dangerous for health, and for driving, so please drink in a moderate way !… I’m sure you will do so. I’d like to add a third one : wine is gastronomy, gastronomy is culture, culture and arts are a weapon of peace and tolerance ; that’s why we support the nice project, the first Zambian Open Arts International Festival, which will take place the second week of may. I renew my thanks to all of those who helped us, including Anderson security and the diplomatic police. Now Cheers ! and let’s say together, in French, please repeat after me the magic formula, which will free the bottles : “le Beaujolais nouveau est arrivé !” puis A votre santé ! Je vous remercie / Zikomo Kwambiri !" Pour garder un souvenir de cette fête, un « photobooth » avait été installé. Photos amusantes ou sérieuses, les sourires n’ont pas manqué. Cette célébration a donc été possible grâce à la Chambre de Commerce Franco-Zambienne mais, aussi, grâce aux nombreux sponsors : AGS, Aquasavana, Bolloré, Bureau Veritas, CFAO, CMA CGM, Colas, Intercontinental, JCDecaux, Lafarge, Michelin, Newrest, ORCA, Razel-Bec, Renault et Total.